uncovered text: "believe..."; Believe that there is more art in you. It is said that one of the best ways for an artist to let go of inhibitions and make more art is to practice non-attachment. This is different from detachment. Detachment means you really don't care (or pretend not to). If I didn't care about my art, I wouldn't put enough energy towards it to ever begin. Or maybe detachment would be a defense mechanism for avoiding negative feelings (such as fear) that often come with creating something new. Non-attachment, on the other hand, is a positive effort. It means you are not attached to the outcome. When I'm practicing non-attachment, I don't have preconceived expectations for how a piece should turn out. My ability to do this comes and goes. It doesn't help that I'm always dreaming up projects (like gifts for friends) and I have only a fuzzy idea of how to create what's in my mind, but I'm very certain from the start that it needs to be amazingly fabulous- my best work yet. Right. Best of luck to me. I think a lot of the work of non-attachment happens in the mind. Learning to silence the inner critic and not pass judgement on our art while we're creating takes practice. There is also the goal of being in the moment and creating for the joy of the process rather than the end result. As artists, we are constantly working on both of these things. let go of attachment. If a piece was destined for destruction, it would not be as precious and would discourage the artist from struggling towards some idea of perfection. The artist could just create freely in the moment, practice their medium and not be tied to an end result. I do think I might show up and make a lot more art this way, and eventually my technique would develop. For me, a more gentle practice of non-attachment is to paint over a piece that's not going anywhere. (I used to not be able to do this for fear of losing something that I might be able to salvage.) Tonight I pulled out an old canvas that I'd been holding on to in hopes of some spark of inspiration. I decided to gesso over it and start fresh. As I worked, the wet gesso (acrylic primer) caused the collaged paper underneath to lift and form air bubbles. I was not having that so I scraped at it with a putty knife. 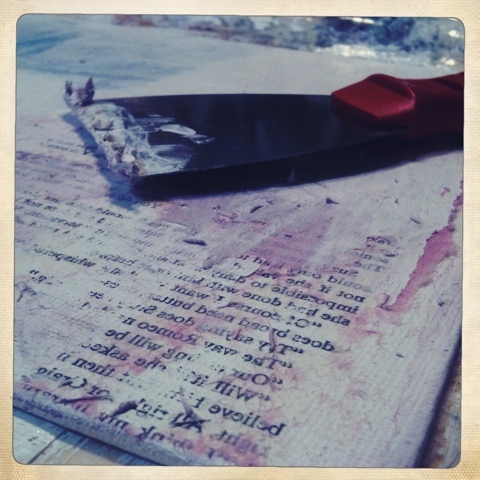 The result was a cool distressed texture of the chalky gesso with the old paint color peeking through, and an uncovered text transfer where I had used gel medium to glue down book pages. I was delighted! I love the effect! I've discovered a technique for creating textured backgrounds in my mixed media pieces and image transfer on canvas. Today non-attachment made room for happy accidents to be born! We must learn to let go of what is not serving us to make room for new expressions. We must trust that more and better art will get made. So go ahead, paint over it. There is more art in you where that came from.